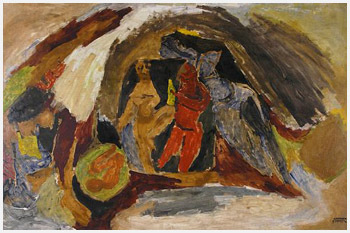 As a son of Maqbool Fida Husain, the celebrated early Indian modernist, Shamshad had to struggle against the immediate and powerful influence of his father to create his own distinct style. He was commissioned to do murals and sculptures. In 1969-70 he did two murals in Jaipur and Delhi, monumental sculpture of a scientist in hyderabad in 1981, sculpture in fibre glass and a relief in Delhi in1986, and another metal relief in Mussoorie in 1988. Lives and works in New Delhi. 1964-68 Did diploma in Fine Arts from Maharaja Sayajirao University, Baroda. 1979-80 Post Graduation at Royal College of Art, London. 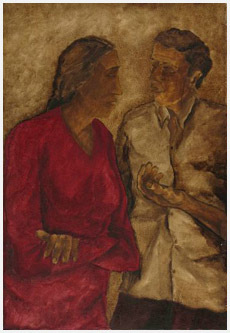 1983 Received the National Award, Lalit Kala Akademi, New Delhi. 1983-85 Received Govt. of India Fellowship. What Shamshad has imbibed from the art milieu at home is the pictorial significance of the human figure both as an artistic expression and a statement of faith in mans social existence. This was latter reinforced by the prevailing art ideas and ideals in the academic circles in Baroda during his sophomore years. At Royal College of Art, his exposure to what was emergent in western art could have broadened the range of his imagery, but his concern in man as a social being has left a permanent impress on his art. Shamshad adopted the graphic clarity and the adopted the graphic clarity and the essential flatness of the painted surface as important elements for his painting. Shamshad paints people with a restrained palette and people on everyday social plane appear in pictorial space uncluttered with realistic details of the `place`.